Ellison Rowe, a Lupine Shifter, makes it his goal to protect Maria, once held captive by ferals, from male Shifters looking for mates. He likes Maria's resilience and fire, but she's been broken, and Ellison wants more than anything to heal her. When a new danger threatens Shiftertown's cubs, Maria partners with Ellison to stop a cold-blooded criminal. 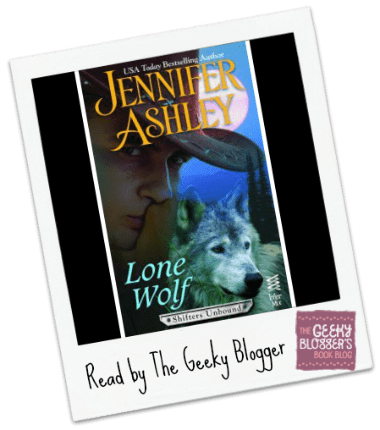 First Thought when Finished: Lone Wolf by Jennifer Ashley totally rocked for a novella. Overall Thoughts: Y’all know I am not a fan of novellas but clearly Jennifer Ashley writes them in a way that makes me swoon. I can’t speak to how this would hold up if you hadn’t read the series BUT if you are a fan of the series already–THEY CAN’T BE MISSED. This was the perfect story for Ellison and even though I read it AFTER Tiger Magic, it played really well as a setup to that story. Ellison has always made me swoon with all his Cowboy Swagger. Maria was a perfect fit for him. This also had a little bit of Pablo in it which for a murky grey guy is kind of growing on me. You just can’t miss these stories if you are a fan of the series. They are swoony and action packed!